What are the chances of you doubling your blackjack bankroll vs. busting out? Do you think the probability of doubling your bankroll would increase or decrease if you decreased your starting bankroll, say, from $200 to $100? Or what if you started with a bigger bankroll? Do you think that would improve your chances of doubling it? I’m a basic strategy player. Let’s say I sit down at a $10 minimum table with a $200 bankroll. I say I have a greater than 50% chance of doubling my bankroll before going broke. My husband says I have less than a 50% chance. Can you settle this argument and tell me who’s right? This is an interesting problem and one that mathematicians have actually studied for centuries. 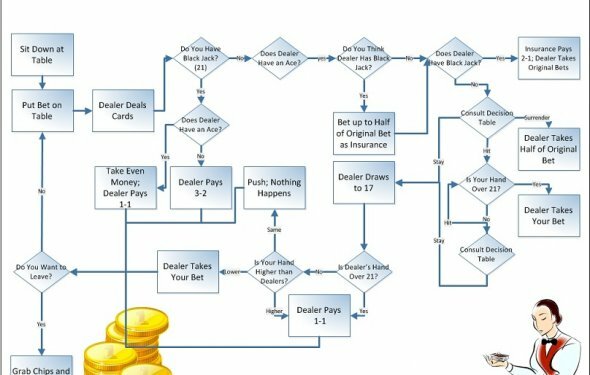 A mathematical equation was developed, called the “Gambler’s Ruin, ” which allows you to calculate the probability of doubling a bankroll before going broke for a given house edge, bankroll size, and number of betting units. The equation assumes an even-money payoff, which is not always the case in blackjack (due to doubling down, pair splitting, and 3-2 payoffs for a blackjack). However, for many reasonable numbers of units of bank, it gives a close approximation of the probability of doubling a bankroll vs. going broke. To be clear, this assumes there are no time constraints when you play, meaning you sit down and play until you either win $200 or lose $200. Under these conditions, your chance of doubling your bankroll is 46%, and your chance of busting out is 54%. Now let me pose this question. Do you think the probability of doubling your bankroll would increase or decrease if you decreased your starting bankroll, say, from $200 to $100? Or what if you started with a bigger bankroll? Do you think that would improve your chances of doubling it? The percentages in the table clearly show that the chances of a basic strategy player doubling his bankroll (vs. going broke) decrease if he starts with a larger bankroll. This makes sense, because the larger the bankroll that you try to double when you bet one unit on each hand, the longer you will have to play—and the more your bankroll will be exposed to the house edge (thus increasing your chance of going broke before doubling the bankroll).